Mangaluru : As promised in the budget, the centre has carved a separate department for fisheries out of the Ministry of Agriculture and has released Rs 500 crore in the initial stage to implement welfare schemes for fishermen community, BJP National Joint Organising Secretary B L Santhosh said on Thursday. 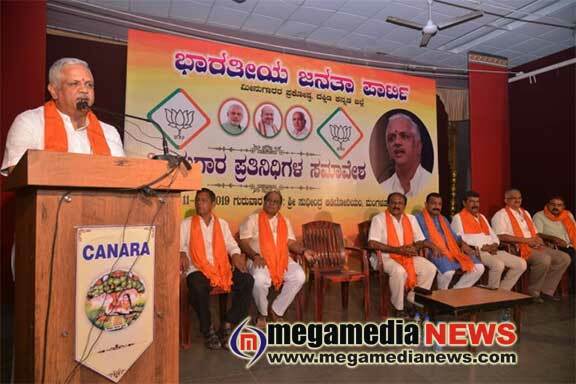 “In the next new government, the department for fisheries will have a separate minister,” Santosh said during a fishermen’s meet, organised by BJP Fisheries Cell, at Sudheendra Hall in Canara Girls High School in Dongarakeri. One of the objectives of the Modi-led central government is the development of people who are in the lower strata of the societal pyramid. The prime minister has ensured the progress of people from all walks of life, he added. Laying thrust on the development of fishermen community, the central government has initiated ‘Ocean Smart’ programme, which provides the information on the availability of fish in the sea, based on latest technology. The programme benefits around five lakh fishermen, Santhosh said. Members of fishermen’s association submitted a memorandum to Santhosh requesting facilities to fishermen on par with the farmers. Santhosh said that the central government had now considered fisheries as an industry to ensure more facilities to the community. The members have also urged centre to scrap road cess for vehicles transporting fish and also to increase the quantity of kerosene for traditional fisheries boats in the budget. Kaup MLA Lalaji R Mendon said there was a need to implement regulations to ensure facilities to traditional boat fishing. The management of fisheries ports should be handed over to fishermen. He, meanwhile, urged fishermen community to stay united and fight for their causes. Ullal Town Municipal Council President Babu Bangera, KFDC former chairman Ramachandar Baikampadi, leaders Nithin Kumar, Pratap Simha Nayak, Gopalakrishna Herale and Shobhendra Sasihitlu were present.